Pearly white and silver LED Christmas garland, battery operated (2 x AAA) with an automatic timer function that lets you switch the lights on for 6 hours and off for 18 hours automatically. Pearly white and silver LED Christmas garland, battery operated (2 x AAA) with automatic timer function that lets you switch the lights on for 6 hours and off for 18 hours automatically. 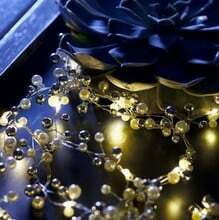 Our Festive LED lighting garland decoration will add a touch of romance to your Christmas and is available with either 20 LED lights or 30 LED lights.